PS: Well, first off I want to say thanks for doing this. I’ve been a big fan for a while and it’s an honor to get to talk to you. Edgar: I appreciate the thought. Sort of a bit of an honor for me, right. This really surprised me. Nice one. PS: Good to know you’re known in Chicago, right? Edgar: Oh, is right, la, yeah. I do like Chicago. I discovered the Easybeats in Chicago. I was playing a gig with Ian McCulloch and there was a record shop underneath the venue. It was kinda—it looked a bit like it might have been an old Victorian theatre or something. There was a record shop outside and they were blasting “Gonna Have a Good Time” and I bought the album there and then. So, yeah, at 19 years of age, la, so yeah. PS: So it’s been awhile since you’ve been back? PS: Alright, well yeah, looking forward to talking to you about the new album and also the reissue and your career, because I’m going to be jealous here and ask you all the questions I’ve wanted to ask you for years. PS: And I read that interview, I actually did see that. PS: Oh, OK. Well building off the “Bido Lito!” interview, you talked a little bit about this new album, working through ill health and kind of finding your voice again. And I think in that interview you said you kind of ran it into the ground with Free Peace. Edgar: Yeah, yeah, well me health and generally I’ve not looked after myself for many years. And there was complications in me life which just caused my system to rupture, really. PS: So coming out of that and coming through the other side of it, how did that affect the writing and recording of Sense of Harmony in a different way than any of your past albums? Edgar: Well the big thing is still being ill while I was doing it. This old friend of mine was really encouraging me to write songs, and I got back into the art of the song. And I listened to what I see as strong songs a lot—I was deliberately spending sometimes whole days checking out Brill Building stuff, Motown, Neil Young, Beatles, Bowie. Just getting back into really ordinary staple diet music, ‘cos for many years—I don’t know if you can make this separation yourself—but there’s great songs and there’s great records. Eddie Bo makes some of the best records ever, but he hasn’t really wrote many songs. D’you have to have a brief explanation of where I’m coming from? PS: I think I get it. Edgar: Yeah. All respect to him, he’s one of—he’s a God to me. But he’s not a strong songwriter as such, whereas Neil Young or I dunno … he’s probably capable, but he’ll probably never write a “Life on Mars.” [Laughter] You got what I’m saying then. The attention was directed that way more. PS: And did it affect the vocals too? Because I notice like in “What’s a Boy To Do” or “I Would Do Anything,” you have a lot gentler delivery than you’ve had maybe on the Joneses albums or on The Masked Marauder. Edgar: Yeah, definitely. Erm, yeah, it was just I didn’t have that much strength in me voice, really. I suppose I was more nervous singing at a voice level, which is something I’ve learned a lot from, but when I do gigs, I end up using me throat again. It’s one of those things. PS: Well is it something—I mean did that contribute to the ill health? Was it overtaxing your voice in any way? Edgar: Eh, well they were kind of final nails. The roots of the whole thing was bad diet, way too much milk and sugar, coupled with bad teeth, so I never chewed me food properly. And the bad teeth also led to me having like in me teens and early 20’s, not having a painkiller addiction, but being able to neck a whole bottle in a day without it affecting me stomach, cos I didn’t need me stomach pumping. But obviously years later, it’s just a lot of small things combining together over a period of 20 years and I suppose the Free Peace thing was the straw that broke the camel’s back, really. PS: And jumping from—I got the Stormy Weather album too—and jumping from that into Sense of Harmony, the song style changes quite dramatically. PS: Well, you never know unless you try, right? Edgar: Yeah. It made me really ill.
Edgar: Yeah, and I was amazed when you said [in an email] Lovin’ Spoonful, ‘cos John Sebastian was another of the said songwriters. Edgar: That’s one of me favorite songs ever. PS: It’s just great. So when you’re talking about listening to those kinds of songs—what else were you listening to at the time? Edgar: I got back into the art of 1966 music that I loved around the Stairs time. I think a major difference as well was I stopped listening to so much atonal classical music and started getting into the early romantic stuff, y’know—Mozart, Beethoven, Brahms, things like that. ‘Cos my entry to classical music was through tipoffs from things I’d read, ‘cos I love Charlie Mingus. He was as atonal as it got, but I can’t remember what it was that turned me round to it. I think it was just the cheapness of the dodgy Gramophone box sets on Amazon. [Laughter] I was a bit skint and I wanted to buy a lot of music for very little and you know, you can get a complete Mozart box set with all his symphonies, you know they used to be 200 pounds and now they’re a tenner, so I think it was partly that. So yeah, listening to a lot more tonal music and getting turned on by that again, not needing so much atonality. I think it has its place, the tonal as well, y’know. PS: So let’s talk about that rerelease. It’s only been 7 years since it first came out, so what was the idea with putting it out again right now? Edgar: Well it was partly the return to health. We’d been thinking about it for a year, but we’d been waiting to run out of them, basically. I guess it just seemed a nice thing to do to reintroduce meself with a popular album a coupla weeks before the new one came out. PS: Well yeah and obviously it got a lot of people talking. 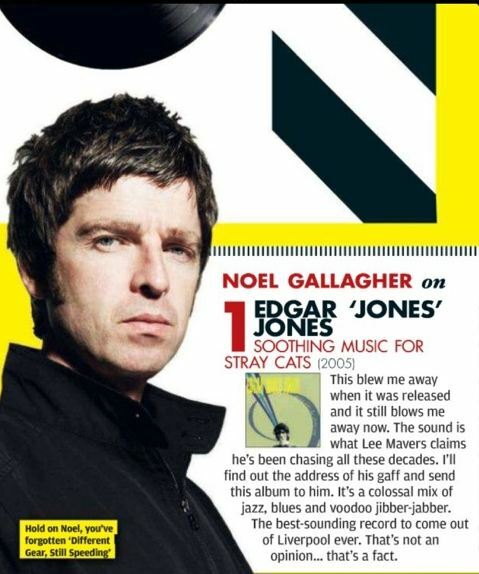 I know every time that album’s mentioned, Noel Gallagher’s quote comes up about it, and NME and stuff calling it “The Best Album You’ve Never Heard.” So when you get treatment like that, how does that sit with you? Edgar: It’s pretty nice actually. It’s funny—one of the songs on the reissue, “Careful What You Wish For”—it ties in with that. I kinda wrote that song because when I was in the Stairs days and stuff like that, I suppose it’s something that’s not changed about meself. So what I’m saying is relevant. And, you know, the Stairs records weren’t massive. We weren’t a massive band. We were liked by musicians, and I guess I’ve always liked that kind of thing where they got name-checked by other musicians. That really means a lot to me. But I remember going into record shops on Portobello Road in London in the Stairs days and looking at the Standells and Chocolate Watch Band albums when they were like 50 pounds, and I was thinking, “Wouldn’t it be great if the Stairs album was next to the Standells one for 50 pounds?” And then 10 years later, it was. [Laughter] You know, it kind of ties in with the “Careful What You Wish For” thing. I guess it’s something about me that hasn’t changed. I find it just as gratifying to be noticed after the fact as I do when things are happening. It’s a shame, really, for me bank account that that’s the case. [Laughter] But I get by, so it’s not really a problem. Yeah, I guess it keeps you going, these things, don’t they? I think I’d keep going if I never released anything anyway. I’m drawn to the muse constantly. But yeah, these things do help. PS: Yeah, ‘cos the only way I knew that song—there’s a little clip of you doing it in Japan on YouTube. Edgar: Yeah, there was a few Mark Lamarr sessions that we did. We couldn’t find the tape of one of ‘em. There’s a whole band version of “Huny Brown” knockin’ around somewhere, but I had to put out my own demo, like. PS: Was that just something that you guys had written later on, did that come after Gettin’ a Little Help From the Joneses? Edgar: Yeah, we were planning on doing a third Joneses album. We had about 90 percent of the material ready for it. We had about 8 strong songs. I was looking for 2 or 3 more before we committed to an album, but yeah, the likes of “You Want Me to Want You Back,” “Another Side of Huny Brown,” “Hey Joseph,” “Don’t Break My Heart.” There was a few instrumentals, one called “Cigarettes and Coffee” that was rather good. Kind of like a Blue Note jukebox record from the early 1960s kind of thing. Yeah, we were nearly about to look into recording a third. PS: Well I’m glad we got at least some of those songs out. And I know there was acoustic version of “Hey Joseph” on the live album too. Edgar: Oh on the Japanese one, yeah it was just the radio station thing that that was from, yeah. PS: Great cover of “My Babe” too on that, by the way. PS: I haven’t heard that version of it. Edgar: It’s a great arrangement, isn’t it? Edgar: Oh, sound. Ah well check out Art Neville’s version anyway. I’m even copying the way he sings it. But what a tune. PS: So another thing I wanted to ask you about—you were in an early incarnation of Johnny Marr’s Healers. PS: With Zak too, and I know that by the time the actually got released it was at least a couple years later. Edgar: Yeah, well that was the reason I offed ship, really. We’d kind of been playing and getting together over, sometimes, months apart. Took two and a half, maybe three years and things didn’t look like they were speeding up, unfortunately. So yeah, I got the phone call for the Weller job and I accepted. It was a tough choice to make, because we were quite the hot three-piece, like. PS: Going back to what you said about the Healers, you said you took the Weller job because the Healers thing wasn’t taking off. I mean obviously you’ve worked with a lot of different artists—is that something that you look for? I mean if you’re gonna join in this, play on this, whether it’s live or on an album, does it have to be cooking? ‘Cos I know your time in the La’s never really produced anything, right? Edgar: Yeah, it was about like two years, really, I mean I was only there for the second year of it, where Lee was living in London and just not pulling his weight, really. You know, during the year I was there, I think the whole band got up to play maybe for a couple of songs on two occasions. It was very messy to see, like. It’s a shame, really, I still see him as the main talent in town, really. As we get further from the fact, it gets more distressing. PS: I know he played out a few months ago with Gary out of the Bandits. Edgar: That’s correct, yeah. I believe they fell out recently and it’s all over again. PS: But when he does resurface like that, does it encourage you at all, or is it just “Well, he’s still doing the same stuff he was doing all those years ago …”? Edgar: Erm, I kind of—it’s one of those things where you spend so many years on the edge of your seat hoping that something’s gonna happen that you kind of get fed up with wasting your energy on it, really. Again, a great shame, but it’s hard to break out of the cycle of behavior isn’t it? You know, it’s something that I’ve been working on meself in the past year, you know to diet and just have a healthier outlook on life and not to let things stress me out and stuff like that. And I guess when you’re in that cycle, it changes slightly all the time, but at the end of the day, you’re still orbiting the same sun, aren’t you? PS: Gotcha. And now going forward, are you looking to put together a band again or do you think doing the solo thing for a while is going to suit you? Edgar: Erm, well, I’m putting a band together to do the solo material. Actually one of the reasons I was demoing so hard the other week was when I made Sense of Harmony, because I didn’t really know what—it wasn’t really a planned album as such, I was just recording tracks if you know what I mean. ‘Cos I was writing them, a lot of the time with the idea that they were gonna be performed by someone else, but basically as soon as I got an idea, I’d go to the tape machine and build up the idea on the tape machine. 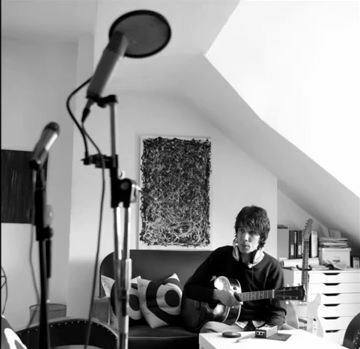 But when I could see that the album was finished as such, I started writing after that. The plan was to live with them and perform them, because I found that if I was gonna go out and have a career again, that it was too itty bitty—Sense of Harmony—to go out and perform live. Things will need rearranging. I mean, I’ve got arrangements for about 5 or 6 of them that I can use, but for the lot of it, it’s kind of a bit too easy rolling to do the kind of show that I like to do. You know, we can always sort of Otis-up “I Would Do Anything”—give it the “Just One More Day” treatment, y’know what I mean? Elongate it. But some of the other stuff I don’t really see as the kind of stuff I like to project on stage. So anyway this is a long answer, so yeah I continue to perform these new songs, and I promised myself that I wouldn’t record any of these until Sense of Harmony came out. 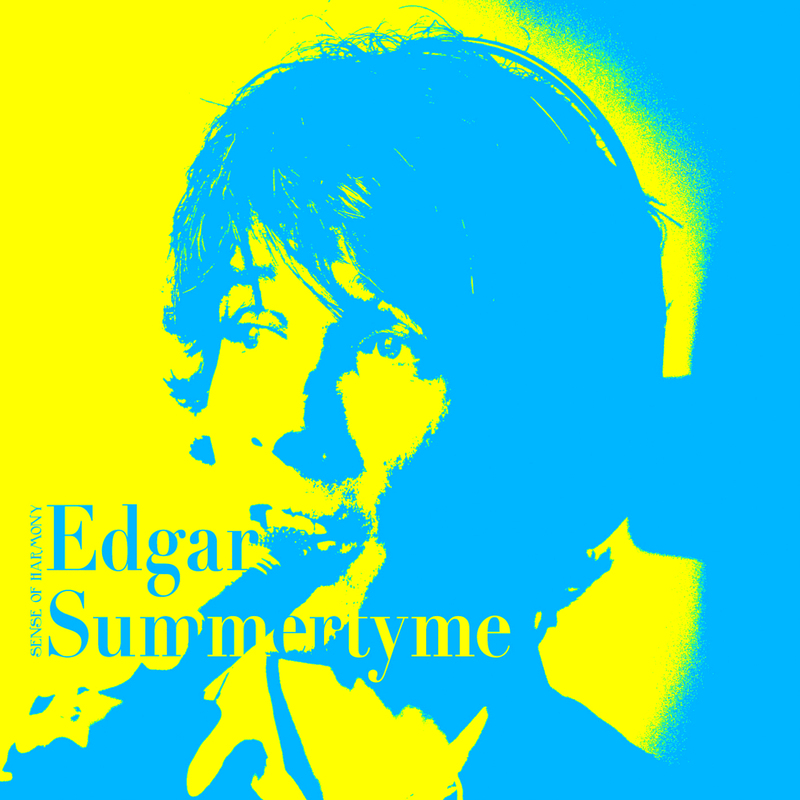 Edgar: Like basically the other week, I was head down, demoing and I’ve got about 10 of them half-finished anyway, so the album probably won’t appear ‘til this time next year, but the songs are all ready and willing anyway. PS: Cool. Well that’s exciting to hear. Edgar: Sorry, what was your question? [Laughter] I’m sure the answer was right somehow. Edgar: Ah, yeah, you were asking planning to do a band. I am. But it will be a band to pursue me solo. PS: And then any other projects? Anyone calling you to play bass? Edgar: I’ve knocked back a few bass playing things, just because I really want to concentrate on this. If there were some decent tours, I’d probably take it up because I do love playing the bass and having less vocal responsibilities when I do it. Yeah, if the right call came along, but I do have plenty to focus on at the moment. PS: It sounds like it. And I prefer to hear you have an album coming out as opposed to you’re playing bass with someone. Edgar: Yeah. Nice one, nice one. I’ve been around the past couple of months, I’ve started doing gigs again, but just on me own, like a little Vox amp with tremolo on the 330, which sounds really nasty. So it’s a bit like the acoustic shows. I’m mostly doing support slots, cos I don’t really think solo performances should go on for more than a half hour, really. But there’s this thing at the end of the month—Liverpool’s Psychedelic Festival—and ‘cos I didn’t think, ‘cos my stuff is very soul-y like a lot of the stuff off the new album. There’s another side to the new album that I didn’t really wanna perform on me own, ‘cos there’s a lot of like three- and four-part harmonies again. I’m introducing me band at this gig. But they’re not playing. They’re only singing with me. [Laughter] Without being too big-headed, I know the people are kind of waiting for me to do a band, so I thought this might do. PS: Now how long were you with Weller during Heliocentric? I know you did the Royal Albert Hall show, cos I know that DVD’s around. You did a Jools Holland appearance too, right? Edgar: Yeah, there was a Jools Holland and there was a John Lennon tribute thing. We did “Instant Karma” on that as well. I was the only scouser on the program and I was the only member of Weller’s band who didn’t get name-checked. So I’ve had a gripe with Jools Holland since I was a knee-high and I was in Ian McCulloch’s band and I was the only one in that band he didn’t name-check. [Laughter] I can’t remember what the other one was, but he done it to me 3 times anyway. Ah that was it, it was the Lennon thing, and the Weller appearance and he name-checked everyone in the band apart from me. PS: Did you guys record anything or was that just a touring gig? Edgar: No, because he was kind of in between days. He was recording Heliocentric. It was rather unfortunate how it came to an end, really. The reason why he got me and, initially, his cousin in was because Ocean Colour Scene were rather busy and he wanted an independent band of his own. But his cousin left a few days before and it was kind of stressing him out too much. And it’s a shame ‘cos he was really good, but I guess he just had a mental picture of it being more than he could handle, which wasn’t the case, but once that’s there, it can be fatal. So Steve was brought back in. And the Heliocentric year, which was a bit of a disaster with the record company releasing the single, withdrawing them after two weeks and putting them out again three weeks later, it was quite the messy year on the record company-front in this country. And possibly in the States as well, because our American tour was cancelled. I remember that. PS: I remember that too. I had tickets to a Chicago show and then we got the notice that it was cancelled. Edgar: Ah, well, another time, mate. Edgar: Yeah, so at the end of it, someone suggested doing a few acoustic shows on his own and just 5 or 6 around the south. And they went so well that he ended up being on the road doing that for a year and a half. PS: Yeah, and actually I caught him on that tour in Boston with Gem out of Oasis. Edgar: Right. Sound. There you go, then. So it was kind of thing, if he did need a bass player, Damon was in London and no longer busy. It’s kind of very much like an old man’s social club, the Weller thing. If you been around long, then loyalty’s shown to you. It’s good. I didn’t mind at all. PS: Any Liverpool bands at the moment that are really on your radar or that you’re really excited about? Edgar: There’s some nice things coming up. Well I’ve name-checked the Wicked Whispers who’ve kinda got a nice little British psychedelia thing going on. They just get better every time I see them. I’m trying to think, there’s a lad who’s a cousin of one of the Coral, I just can’t remember the name of the band. It’s escaping me. We’re gonna be playing with them. Ah, the Sundowners. Just happy little mid-Sixties pop. The next generation’s coming up and doing their bit, really. PS: I’ve got a friend here who’s got a friend in a band called By the Sea and he’s been trying to pump me up on them. Have you heard of them? Edgar: I’ve heard of them meself. I haven’t come across them, but the name definitely rings a bell. Another one, not Liverpool, but Manchester, there’s a kind of a mutual friend and mate of me girlfriend’s called T.G. Elias. Paul [Hemming]’s putting something out by them in October. He’s made little albums on his own, so Paul’s kicking it off by compiling the best of his 3 albums that he sells at gigs if you know what I mean. He’s just got one heck of a voice on him, he’s really look after him. I’ll try to make sure that Paul sends something over to you or something. I was just gonna say one of the things—hopefully we’re either doing a download single or possibly pressing vinyl early in the new year. There’s a couple of tracks that didn’t quite make it on to this and aren’t suitable for the next one. There’s a bit Edgar Jones Jonesy as well. Rhythm and blues. There’s another band in Liverpool that I forgot about. They’re called the Blind Monk Trio. It’s basically jazz—Thelonious Monk, but without piano. It’s the drummer who plays on “What’s a Boy To Do”—Colin Lamont—I got about 4 drummers to do that and he was the only one who could do it, you know, could play a light jazz over it. Everyone else just started playing a waltz and made it too heavy. But if you can find ‘em, they’ll probably have some recordings on the net, but because there’s no piano in it, I don’t know if—do you like Thelonious Monk? Edgar: There’s no piano in it. It’s just double bass, drums and saxophone, there’s a hell of a lot of space. Colin’s brilliant at breaks. I’m trying to get a label in Japan to release some stuff, because jazz isn’t really Paul’s thing, like. It’s more the rhythm and blues side that got him. PS: Well if there is a vinyl pressing, shoot me a line, ‘cos I’ll get my wallet out. Edgar: Is right, la. Nice one. It won’t let you down, either.